Kevin C. Cox/Getty ImagesPresident Donald Trump wants a military parade, more nukes, and a great power competition with Russia and China. 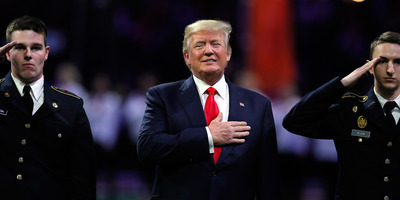 President Donald Trump has ordered the US military to put on a grand parade, a request Democrats and commentators have used to liken him to a dictator. The US has previously put on many military parades, however, often displaying its nuclear weapons at the height of Cold War tensions with the Soviet Union. Trump’s military and foreign policies involve a return to the Cold War era of great-power competition. The US military is posturing itself toward confrontation with a rising Russia and China. President Donald Trump has directed the Pentagon to prepare a grand military parade in Washington, DC, and the initial response has been largely negative. Democratic lawmakers quickly came out against it Tuesday night, with Rep. Jackie Speier of California telling CNN “we have a Napoleon in the making here” and saying “everyone should be offended” by the idea. “Oh my god… he wants to be Kim Jong Un,” the MSNBC personality Joy Reid remarked on Twitter in response to the news. The Pentagon is said to be exploring dates for such a parade. But if it does happen, Trump wouldn’t be the first US president, or even the first modern one, to hold a military parade in Washington, DC. There’s a long history of military parades in the US, but its recent history is anchored in the Cold War, when the US showed off nuclear missiles long before North Korea’s Kim dynasty even had the capability. In 1953 and 1957, Dwight Eisenhower’s inaugurations included nuclear-capable missiles rolling down Pennsylvania Avenue. In 1961, John F. Kennedy’s inaugural parade included four types of nuclear missiles, the nuclear historian Stephen Schwartz pointed out on Twitter. Both Kennedy and Eisenhower presided over some of the most tense days of the Cold War-era nuclear-arms race with the Soviet Union. In Kennedy’s case, a frightened US had just watched the Soviets’ Sputnik satellite, mankind’s first, passing through the skies. American schoolchildren were drilled on how to hide under desks in the event of a nuclear attack. After all, if the Soviets could put a satellite in space and fly it around the world, they could also put up the bomb. On the other end of the Cold War, when the US emerged victorious from the Gulf War, President George H.W. Bush brought back the military for another parade. The US victory had been decisive, with Saddam Hussein’s army, the world’s third-largest at the time, decimated by superior US military power. Though 20,000 to 30,000 US casualties were forecast in the conflict, where chemical weapons had killed scores of civilians, fewer than 300 US troops died. The US brought its troops home for a parade in June 1991, when Bush’s approval rating was soaring. Later that year, the Kremlin lowered the Communist hammer-and-sickle flag for the last time. The Soviet Union imploded, and the cold war ended. Renee L. Sitler/U.S. 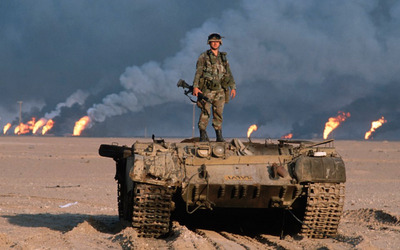 ArmyA US soldier on top a destroyed tank during the Gulf War. Since the end of the Cold War, the US has withdrawn troops from Europe and taken measures to reduce its military footprint and nuclear stockpiles. The Obama administration increasingly treated Russia like a partner and less like a competitor. But late in Obama’s presidency, the tide started to turn. Russia illegally annexed Crimea in 2014 to a muted US and NATO response. Russia intervened in Syria’s civil war the next year and immediately started bombing US-backed forces. Additionally, Russia stands accused of violating arms-control agreements with the US and placing nuclear weapons in Europe, much as it did in the Cold War. China, over the same period, embarked on a massive, ambitious campaign to rebuild its military and dominate the South China Sea, a shipping lane where annual commerce worth trillions of dollars passes through, and where China has ignored international law in building artificial islands in contested territory. The return to Cold War footing for Eastern powers isn’t Trump’s doing and didn’t happen on his watch, but the US’s embrace of a new Cold War definitely is. The Trump administration recently released a series of documents outlining the US’s foreign policy and military bearings. In the National Defence Strategy, the National Security Strategy, and the Nuclear Posture Review, the Trump administration has consistently named its biggest challenges as taming the rises of Russia and China. Trump’s new nuclear posture looks past arms control and toward an arms race. Russia regularly holds military parades. So does North Korea. So do many US allies, including many democracies. Trump’s military parade may be costly, and it may tax an already stretched military, but in context it marks a return to Cold War-era great-power competition.